Red, White and Blue ! Red, White and Blue Challenge ! 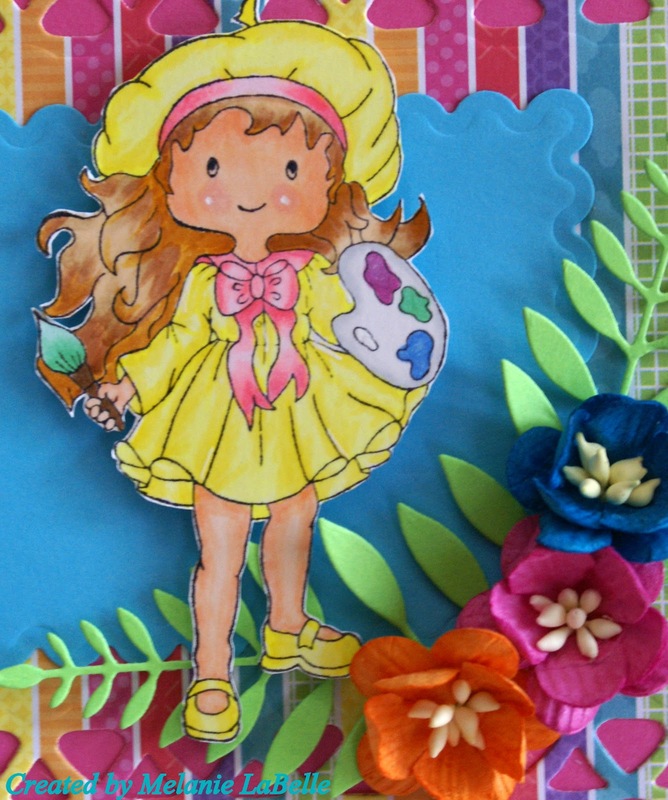 Hope you like my card and participate on this challenge ! I colored my Gilli Girl using copic markers R29, 27, 24, 22, E37, EE 53, 11, 00, B39, 35, 32 C3, 00. I cut the stars using my Silhouette, got a free cutting file from the net! 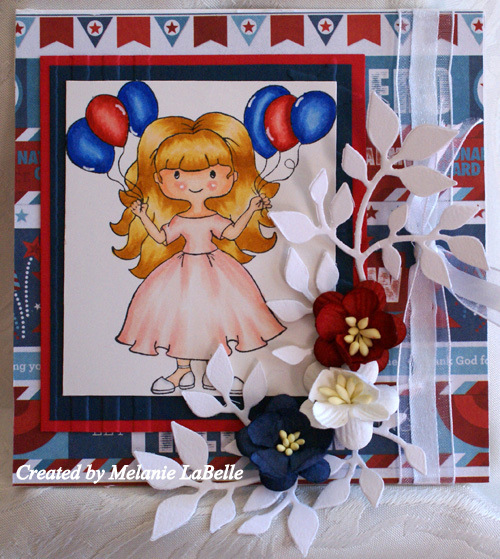 I hope I could inspire you with my card and you decide to come on over to play with us! 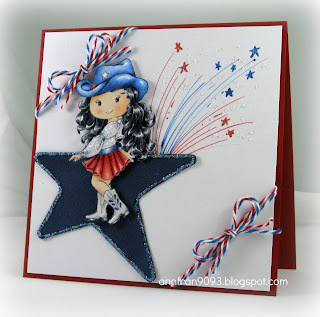 Jo here today with an inspiration card for the Red, White and Blue challenge. Gilli is decked out with her red and blue scrubs. Her shirt has some silver polka dots. My papers are from Bo Bunny. I really like this collection. I have cut the circles with my Lifestyles die cuts. The fireworks are from the Robin’s Nest. I punched some little stars to add around. I broke out my red bakers twine to add just a little more texture. I sure hope you will join us for the challenge this round. Be sure and add your card into Inlinkz at the bottom of the page to be eligible for the drawing. Happy Monday everyone. Melanie, here with a brand new challenge for you, Red/White/Blue. Thank you for all the wonderful entries for our Vibrant colors challenge. 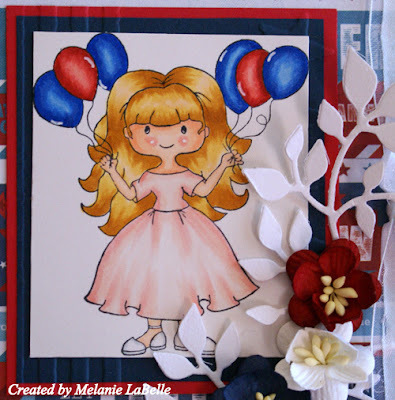 I have to say I really enjoyed creating this card, Balloon Gilli was so much fun to color with Copics. For her dress I used R20/R00/R0000, my favorite colors to use. I know it looks more pink than red, I just didn't want to take away the red from the balloons. 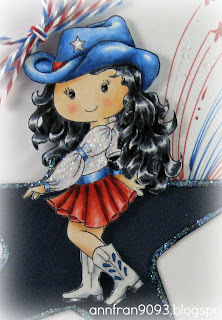 For my mat I glued them together, then embossed the sides with Sizzix Tim Holtz Americana Background and Border embossing set. I also used some cherry blossoms and Sizzix Branches Leaves and Flower die. The background paper is by We R Memory Keepers. Please post your creation below the posts, using Inlinkz. 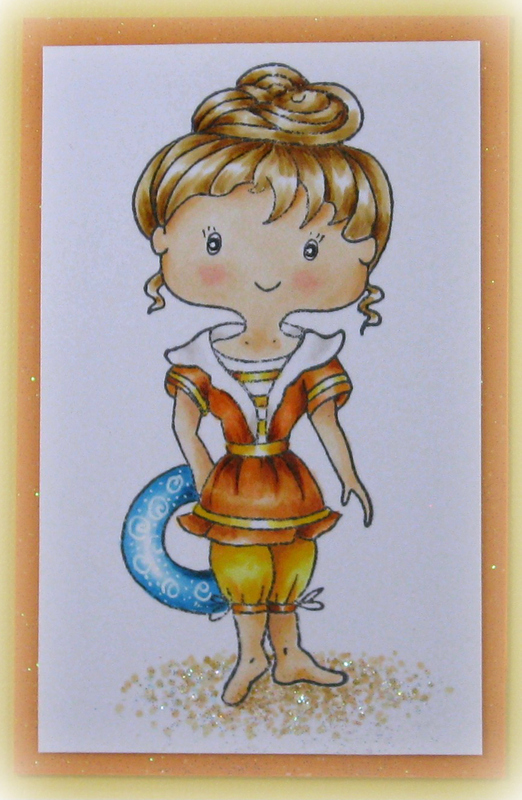 I have to say, this is my first time coloring Painter Gilli and isn't she pretty in yellow. LOL, I used all the colors of the rainbow and then some, but hopefully it looks OK. 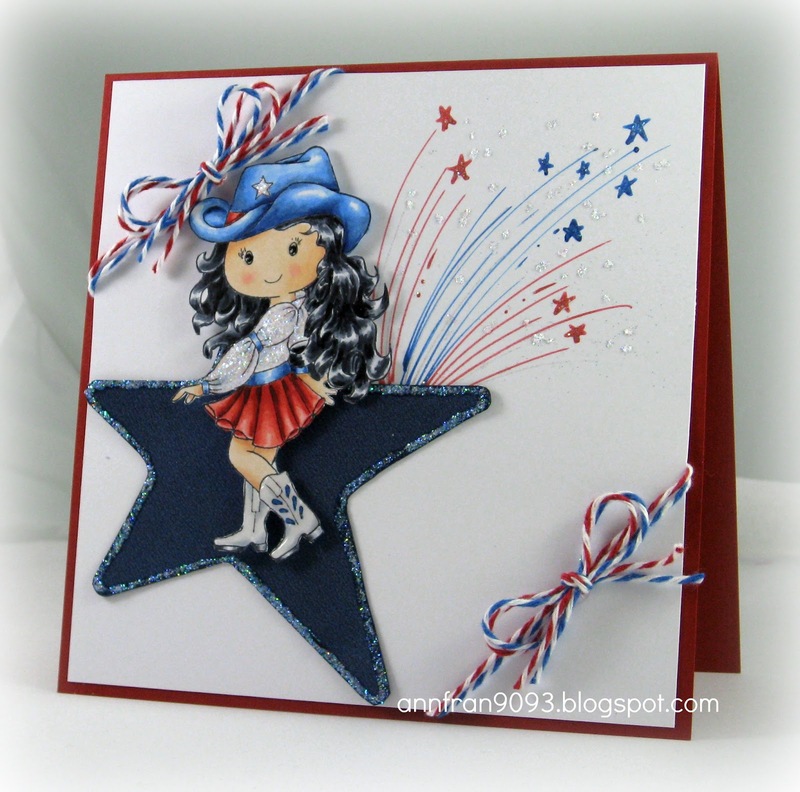 I used a couple of Spellbinders dies but also a new favorite, Poppy dies (Gentle Leaf). I love Cherry Blossoms and how well the colors go with this challenge. Hope you will join in, you still have a few more days to join in. Jo here, sorry I am bit behind this morning putting this up. I sure hope you will join us for our challenge this time around. The theme is Vibrant Colors/Summer. Those two go hand in hand. I have used Gilli Florist for my card today. She is out picking those summer flowers to make a special arrangement. I have colored her with my Copics and added stickles to her shirt for texture. 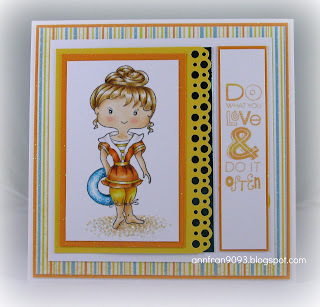 As always we love to see Gilli stamps but you are welcome to use others. Please make sure you link your work in the Inlinkz (at the very bottom of the page) to be eligible for the prize. 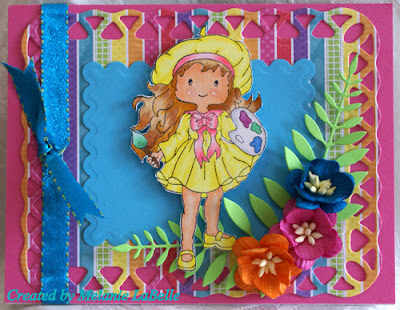 Who doesn't love summer, and what fun to design a card around the wonderful colors of summer! Vivi here and I bring new challenge over here at House of Gilli Challenge Blog today and I’m hosting this one!!!! Wooho!! but before that I want to thank you all that joined us on the die cut/punch challenge with you beautiful entries!!! So, Are you ready to know this fortnight theme!??!?! I picked the gorgeous Lady Gilli for my card. Please, stop my over my blog to see the others materials that I used on this card if you like. I hope you like my card, specially like the theme and come on over to play with us! Die Cut and Punches !! I'm Yone and I'm sorry to be a bit late to post my Punches and Dies Challenge ! Here's my card and hope you like it ! and a small heart, flowers and punched leaves as embellishments. The fence was cut on the Silhouette Cameo Machine. See more details on my BLOG !